We are proud to announce that the University of the Incarnate Word is the recipient of the United Way’s inaugural Higher Education Community Service Impact Award. Dr. Evans accepted the award at the Tobin Center on Tuesday, April 9. This award recognizes a college or university that supports and encourages civic engagement, service-learning, and volunteering as core values. The recipient must demonstrate an institutional commitment to addressing community needs and contribute to the public good through effective campus-community partnerships. For its commitment to serving the needs of the community and incorporating service learning in class lessons, The University of the Incarnate Word was honored with this year’s Higher Education Community Service Impact Award. UIW’s December 2018 graduating class of nearly 1,000 professional, doctoral, graduate and undergraduate students completed a total of 44,584 hours of service in the community providing an economic impact totaling $1,100,779 in volunteer service hours. The award was presented at the 30th Annual Volunteer of the Year Awards (VOYA). This San Antonio celebration is part of National Volunteer Week, powered by Points of Light , and is a time to honor the impact of volunteer service and the power of volunteers to come together to tackle tough challenges and build stronger, more resilient communities. VOYA shines a light on the people and causes that inspire volunteers to serve, recognizing and thanking them for lending their time, talent and voice to make a difference. Congratulations, Cardinals! Thank you for your commitment to serving our community. Sunday Mass at 10:30 a.m. and 8 p.m.
Dr. Horacio Vela - To listen to this podcast, click here. While Palm Sunday marks the beginning of Holy Week with the commemoration of Christ's triumphant arrival in Jerusalem, Lent officially comes to an end on Holy Thursday as the beginning of the Mass of the Lord’s Supper signifies our entry into the Sacred Paschal Triduum. The Triduum is celebrated as one continuous liturgy over three consecutive days beginning the evening of Holy Thursday and ending with vespers on Easter Sunday evening. We invite our university community to join together with our Sisters of Charity and retired citizens at the Village at Incarnate Word in these sacred days of prayer. The transfer of the Blessed Sacrament will follow after communion with a procession to the Lourdes Grotto (next to the SEC building) and a period of adoration until 9 p.m.
Good Friday: Friday of the Passion of the Lord - April 19 at 6 p.m. (Chapel of the Incarnate Word). The liturgy is not a Mass, but includes scripture (notably, the proclamation of the Passion), Adoration of the Cross, and Holy Communion. Easter Vigil: The Easter Vigil in the Holy Night - April 20 at 8 p.m. (Chapel of the Incarnate Word). The Easter Vigil is considered to be the pinnacle of the liturgical year and our spiritual lives. Easter Sunday: April 21. Easter Sunday marks the end of the Sacred Triduum and is the first day of the Easter Octave. The fifty days of the Easter season will conclude with the Solemnity of Pentecost. 10:30 AM – Chapel of the Incarnate Word only. 8:00 PM – No Masses in either chapel. Mass resumes in Our Lady’s Chapel on April 28. Maria Patricia Cantu (Current UIW Student – PhD program) & family on the recent loss of her son, Paul Andrew Cantu. Jesse Hinojosa & family on the recent loss of his wife, Karisa Cummings (UIW Student). Allan Moore Copp & family on the recent loss of his mother, Roberta Van Houten Copp (BA ’71). Gwen Perez & family on the recent loss of her husband, Noe Perez, Jr. (BAAS ’05). Bobby San Martin (Coordinator of the Ettling Center for Civic Leadership & Sustainability) & family on the recent loss of his father, Dr. Roberto San Martin (UIW Friend). The family of Gladys Marie Way (IWHS ’47) on her recent death. 7:00 pm — Eucharist at San Fernando Cathedral, San Antonio, celebrating our founders, Bishop Claude Marie Dubuis, and Sisters Madeleine Chollet and Pierre Cinquin. 8:30 am — Morning Prayer, Chapel of the Incarnate Word, followed by an unveiling of a “150” commemorative plaque in the Incarnate Word Cemetery, honoring our deceased Sisters. 6:00 pm — Eucharist in the Chapel of the Incarnate Word honoring our “great cloud of witnesses” (deceased Sisters of Charity of the Incarnate Word). 3:00 pm — Concert by “Chanticleer” all-male vocal ensemble — Chapel of the Incarnate Word. 3:00 pm — Celebrate the annual “Light the Way” with the University of the Incarnate Word. 6:00 pm — Eucharist celebrated with CHRISTUS Santa Rosa, remembering the first Mass celebrated at Santa Rosa Infirmary on this day in 1869 — Chapel of the Incarnate Word. Join the University of the Incarnate Word for the 2019 Cutting Edge Fiesta Fashion Show, a San Antonio tradition since 1980, on Monday, April 29 at the McNay Art Museum! UIW student designers will present collections they have worked on in a year-long process. Proceeds benefit Fashion Management scholarships for current UIW students. This year's event will kick off with a VIP cocktail reception at 5:45 p.m. (for VIP ticket holders). Doors will open for general admission ticket holders at 6:15 p.m. The show will officially begin at 7:15 p.m.
UIW Fiesta Medal - Now Available! The 2019 UIW Fiesta medal is now available! Purchase yours today at the Campus Life Office in the Student Engagement Center or the Fiesta Store. Medals are $10 on campus and $12 at the Fiesta Store. Dr. Light’s final gathering of the full-time faculty took place on Tuesday, April 9 in the Rosenberg Sky Room. She was recognized as Provost Emerita when all other new Emeritus Professors were acknowledged. Dr. Evans announced that a farewell event will take place honoring Dr. Light the afternoon of Tuesday, May 7. Further details will be forthcoming. Faculty approved for promotion and tenure were recognized along with those granted sabbaticals for the coming academic year. The following faculty received special recognition. These were not listed in the luncheon brochure. Thank you all for your continued support of the events hosted by Dr. Light in her tenure as Provost. Your support and assistance of these events was very much appreciated. Copies of the luncheon program and flyers for the Corporate Cup have been placed in campus mail to your Dean’s Office. Please feel free to share them as you see fit. UIW’s Ettling Center for Civic Leadership & Sustainability, in collaboration with the National Hispanic Medical Association (NHMA) hosted the Greater San Antonio Institutions of Higher Education (IHE) at a conference on Saturday, April 6. Through this conference, the College Health Scholars Program worked to increase the number of students matriculating to health professional schools and graduate programs. NHMA enrolled freshman and sophomore undergraduate students from the Greater San Antonio area interested in health careers. These students will have an opportunity to receive academic support, application process information, and financial aid information needed to achieve success in health professions careers. Watch the NHMA College Health Scholars Program 2019 video here . On Sunday, April 7, the Office of Alumni and Parent Relations hosted the 4th Annual UIW Ring Ceremony. Juniors and seniors who were receiving their class ring were invited to celebrate the day with loved ones beginning with a special mass, followed by a luncheon and ceremony. Fr. Thomas Dymowski blessed the rings before they were presented to students. The School of Nursing and Health Professions hosted a retirement reception honoring Dr. Irene Gilliland, Associate Professor of Nursing. Dr. Gilliland has been with UIW since 1991. The reception was held on Monday, April 8. Thank you, Dr. Gilliland for your many years of service to the UIW community! On Wednesday, April 10, UIW Campus Engagement hosted Viva UIW, an annual event that kicks off the Fiesta season for the UIW community. Students enjoyed live performances, food and drink, cascarones, a grito contest and more. Major General Andrew Toth is the Commander, Air Force’s Personnel Center, Joint Base San Antonio-Randolph, TX. He visited UIW to tour the AVS Laboratory and learn about the work UIW students are doing with drone technology. During his visit, he spoke with faculty and students about the future of this technology and how it is currently used in the Air Force. The General also went out to the soccer fields to watch the students fly the drones and give them a test fly himself! 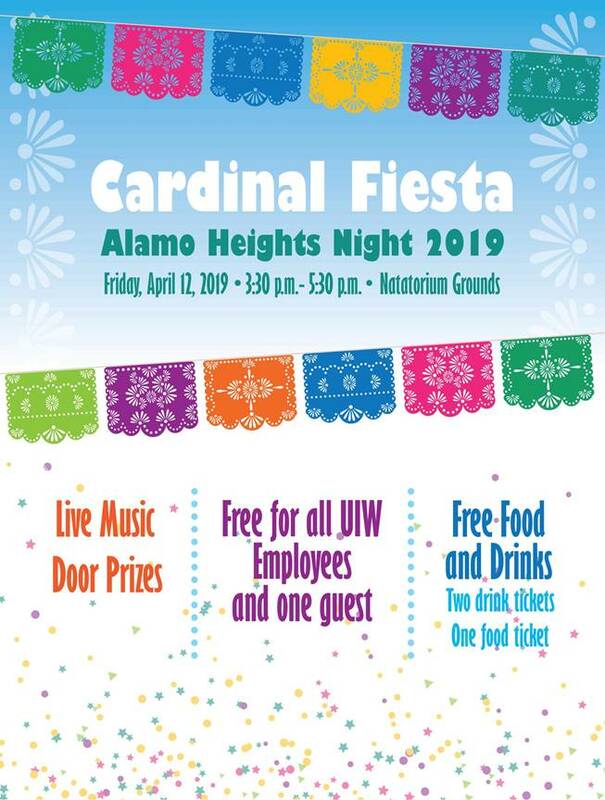 On Friday, April 12, 2019, from 5:30 p.m. to 11:30 p.m., UIW will once again host Alamo Heights Night! The event will take place on the parking lots surrounding the Natatorium and Convocation Center. The event will offer food & beverage booths, games and entertainment for all ages and a fireworks display. Live entertainment from Hotcakes, Skyrocket, Finding Friday, and Michael Brandon. Please join the Alamo Heights Rotary and the UIW community for this fun filled family event! Admission is FREE for all UIW/SACHS/IWHS employees and students with a valid ID Card . If you, or someone you know, plan on attending Alamo Heights Night (public event starting at 5:30 p.m.) and will need ADA accommodations please call the Alamo Heights Rotary Club/Alamo Heights Night LLC at (210) 824-2462. As of 12 p.m., (noon) there will be no traffic allowed from Ancira Tower and the bridge. Beginning at 3 p.m. only vehicles with UIW parking permits will be allowed entrance at Mission Plaza. 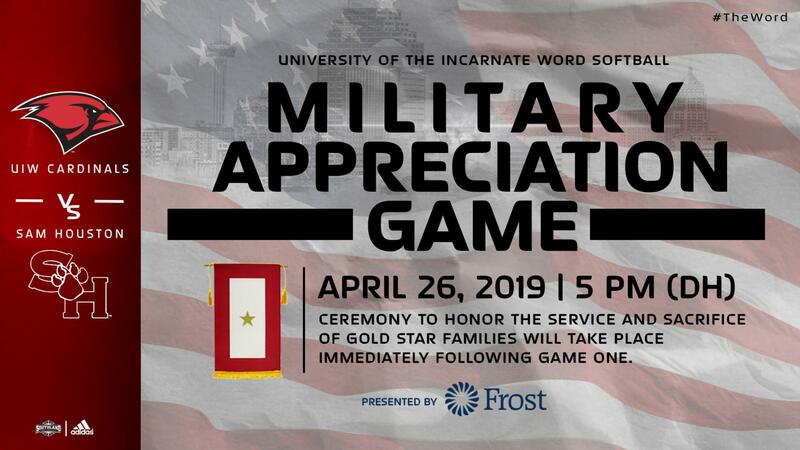 All others will be directed to the ICC Ancira Tower parking areas or to one of the Alamo Heights Night parking locations. On Campus Shuttle Service from McCombs Parking Garage, Ancira Tower Parking Garage and ICC parking lot will run until 12 p.m., noon. Anyone needing to return to their vehicle any time after 12 p.m., noon, has the option of walking back or using the cliff side elevator thru the back of Avoca. Shuttles will stop running at 12 p.m., noon on Friday. On Friday, April 12, the UIW parking lot at Allensworth and Broadway (A-Lot) will be available for parking for all valid UIW permits. Please DO NOT use the Witte’s section of the lot. If you are expecting any visitors to your office or deliveries from vendors on Friday, please let them know in advance that due to preparation for Alamo Heights Night they will not be able to drive from the east side of campus to the west side of campus after 12:00 p.m., noon on Friday. I want to express deep gratitude to all who have contributed to our appeal regarding migrant families. We know that “As you did to one of the least of these my sisters and brothers, you did it to me”. I would like to announce that Friday, April 12 is the last day to drop off your donations and other items for migrants. Our hope is to deliver items as soon as possible to Catholic Charities. The Office of Mission and Ministry (AD 151) and the Ettling Center for Civil Engagement (AD 154) will be delighted to receive donations and see that they are delivered to Catholic Charities. I pray that we, who have been so blessed by God, will hear the cry of the poor and respond with generosity and compassion. If you have any questions, please contact University Mission & Ministry at (210) 832-5316. When a stranger sojourns with you in your land, you shall not do him wrong. You shall treat the stranger who sojourns with you as the native among you, and you shall love him as yourself, for were strangers in the land of Egypt: I am the Lord your God” (Leviticus 19:33-34). “For I was hungry and you gave me food, I was thirsty and you gave me to drink, I was a stranger and you welcomed me” (Matthew 25:35). At this time the migration of UIW telephone numbers is complete. The UIW community will now receive all calls on their new RingCentral handsets. The old handsets are no longer operational and all outbound calls should be placed with the RingCentral handsets. The IRD team and RingCentral technicians are walking through all buildings on Main Campus as well as all remote sites to help troubleshoot any issues that may arise. As a reminder the RingCentral system DOES NOT require long distance codes or require you to dial ‘9’ before making outbound calls. Click here for a variety of videos and training resources if you would like to learn more! Thank you for your patience. UIW Development is preparing to host the 42nd Annual Swing-In Auction Party and Golf Tournament and is requesting volunteers. Click here to register as a Swing-In volunteer for the Auction Party on May 2 and/or the Golf Tournament on May 3. Please view the document to see the year end memo regarding procedures for closing out FY 18-19. We are pleased to announce that the new UIW.edu is now live. The new website features an updated look and feel and was rolled out over the week of Spring Break. The first phase of the roll out included the Health Professions schools sites followed by the main UIW.edu site. Over the course of the rest of the year, the remainder of the academic schools will be refreshed. Thanks to our partners at Elliance for their branding vision and to our internal team, who have worked to implement the vision of One Word on our websites. If you have questions about where to find essential information, please read through the FAQs here. In addition, a video tutorial offers tips and information about navigating the new site and where to find important links. Our internal group will be working diligently to make sure that all pages are accurate, presentable and functioning with the new look and feel. Please feel free to email pr@uiwtx.edu with your feedback. As we continue the transition to the new UIW.edu, please note that all submissions for consideration in the Friday newsletter must be submitted no later than Thursday at noon. Please contact vireyna1@uiwtx.edu with any questions. Celebrate the CCVI Jubilee and support their ministries by purchasing the 2019 celebratory Fiesta medal. Find the medal at the CCVI International Support Office (The Generalate - 4503 Broadway). Medals are $10.